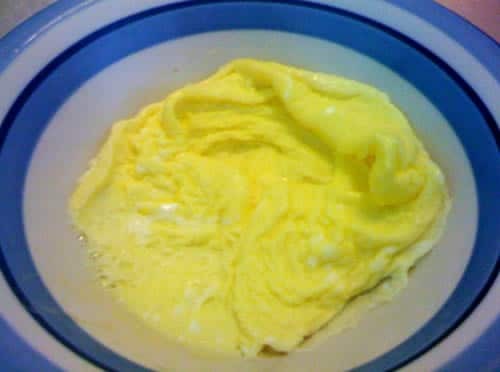 If you happen to be, say, on a desert island and have a microwave but no stove, and you just happen to be craving scrambled eggs, then the answer to your question is YES, it’s possible to make microwaved scrambled eggs. And if you do it right, they ain’t half bad! Crack two eggs into a bowl and scrambled with a fork. Mix in a little pepper to taste. Microwave on high for 30-60 seconds (depending on the strength of your microwave). The eggs will have started to solidify, but there will still be plenty of runniness. 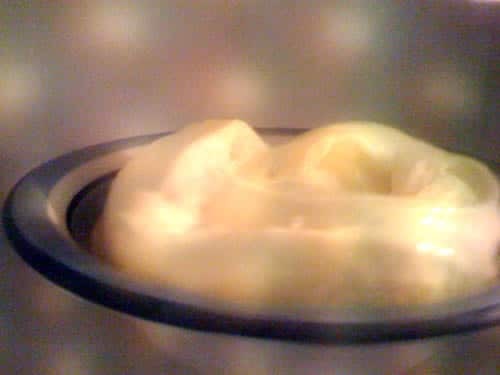 Flip over the partly-cooked eggs (or just stir), and then microwave for 30-60 seconds longer. Stop the microwave when they have just a tiny bit of sheen on them (right before it’s all cooked dry). If you get the timing just right, the last bit of eggs will cook from the heat of the already-cooked eggs, and you’ll have delicious, fluffy, microwaved scrambled eggs! The trick is that you want to be sure the eggs are cooked just enough. Cook them too long and they’ll be tough and rubbery. Also, be sure to use a fairly large bowl — they will expand a bit while cooking (see pic above), and then shrink back down as they cool (see pic below). My cousin is a big fan of microwaved scrambled egg whites-they’re conveniently tasty! Good option for breakfast at the office, before a day at jazzfest, or if you’re at Lee’s place on the island (and actually have eggs!). Microwave scrambled eggs are the best – no grease or oil needed! I use my Pyrex measuring cup. If I make 4 eggs, add diced green pepper, onions, some pepper, some milk, and cook for 1.5 min. Take out, stir, and put back in to cook for another minute. Take out, let sit a minute to finish cooking, and give a final stir. Excellent! (I like mine “hard” scrambled. I love making eggs in a mug. You can also add in any other ingredients you want: spices, cheese, chicken (already cooked and chunked)etc.